ALOR SETAR, 7 July 2012 – The National University of Malaysia was among a number of universities that took part in the three day Caring Day Charity Carnival which ended here yesterday. It was organized by the Sultanah Bahiyah Foundation to collect donations to help the poor. It was launched by the Foundation Chairman, Tunku Panglima Besar Kedah Tunku Puteri Intan Safinaz Binti Tuanku Abdul Halim Mu’adzam Shah, who is also the UKM Pro Canselor. Visitors to the UKM educational booth were given information about its academic programmes both at the undergraduate and post graduate levels and the PERMATAPintar programme. Tunku Puteri Shafinaz also took time off to visit the UKM booth. Visitors to the booth were also interested in finding out about assistance rendered by UKM to those wanting to take up post graduate studies and job opportunities in UKM. A number of UKM alumni took advantage of the carnival to identify themselves. The booth was manned by three staffers from Bangi. Various activities were held in conjunction with the carnival including free health checkups at a mobile clinic set up and opened by the Yang Di Pertuan Agong, Tuanku Abdul Halim Mu’adzam Shah Ibni Almarhum Sultan Badlishah, exhibitions by various charity organisations, cultural shows and sporting activities. 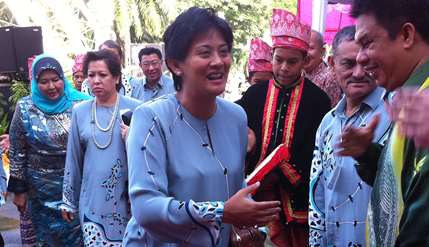 The Raja Permaisuri Agong, Tuanku Hajjah Haminah Binti Haji Hamidun and state dignitaries attended the carnival.